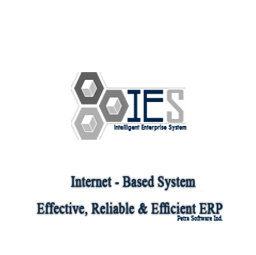 IES - Accounting & Sales Management System - Petra Software Ind. – Availability of add new items and allow to modify or delete its data. – Availability of determine the tax for each item. – Availability of show the inactive items. – Availability of determine the dimension to every item. – Availability of exclude items from sales. – Availability of add inventory locations and capability to modify or delete data. – Availability of add the classifications of inventory and capability to modify or delete data. – Availability of exclude full classifications to inventory from sales, and thus will exclude all items falling under it. – Availability of transfer items between inventories. – Availability of items codes (foreign items codes). – Availability of determine tax exemption for any item you want. – Availability of add measure units for items and capability to modify or delete data. – Availability of decimal points for each measure unit. – Availability of determine the demand limit of items. – Availability of determine pricing sale for each item. – Availability of determine pricing purchase for each item. – Availability of add inventory movement types and capability to modify or delete data. – Availability of determine the standard cost for each item. – Availability of show all movements of each item. – Availability of show items status to each item. – Availability of settlement the inventories. – Availability of add new suppliers and capability to modify or delete data. – Availability of purchase orders and control to late orders and capability to modify or delete data. – Availability of send the purchase order by email of supplier. – Availability of determine the currency type. – Availability of determine and show the credit limit for supplier. – Availability of determine the dimension which falls under it items for supplier. – Availability of determine total tax to supplier. – Availability of determine the payment terms for supplier. – Availability of determine the language of documents related with supplier. – Availability of recording deliveries direct for purchases. – Availability of recording immediate purchase invoices. – Availability of recording supplier’s payments. – Availability of show inactive data that related with supplier. – Availability of send the fund transfer by email for supplier. – Availability of recording the specification of supplier for suppliers invoices. – Availability of recording returned purchase invoices for supplier. – Availability of inquiry for purchases orders. – Availability of inquiry supplier movements. – Availability of inquiry the movements of specification payment and returned invoices. – Availability of add sale groups and capability to modify or delete data. – Availability of add new customers and capability to modify or delete data. – Availability of specify the currency of each customer. – Availability of determine dimension that falls under it customer accounts. – Availability of determine the default inventory location for customer. – Availability of determine sales persons for customers. – Availability of determine tax group for customer. – Availability of determine payment terms for customer. – Availability of determine the default shipping company for customer. – Availability of determine the prices list for customer. – Availability of determine the credit status for customer. – Availability of show inactive data that related with customer. – Availability of determine the language of documents for customer. – Availability of add customers branches and determine the private sales areas with branch and capability to modify or delete data. – Availability of add sales types and capability to modify or delete data. – Availability of add sales persons and capability to modify or delete data. – Availability of determine the percentage of commission for delegate and the maximum limit and percentage the second commission for amount that exceeds the maximum amount. – Availability of add sales areas and capability to modify or delete data. – Availability of add credit status and capability to modify or delete data. – Availability of make sales quotation for items to customers. – Availability of send sales quotation to customer by email. – Availability of enter sales orders. – Availability of send sales orders to customer by email. – Availability of record direct deliveries to sales. – Availability of send template delivery by email to customer. – Availability of recording immediate sales invoices. – Availability of delivery the sales orders. – Availability of invoicing the direct deliveries. – Availability of send sale invoice by email to customer. – Availability of recording periodic sale invoices repeat in specific time that you determined it. – Availability of recording customer payments. – Availability of recording returned sales invoices to customers. – Availability of send returned sales invoices by email to customers. – Availability of specify customer payments for all invoices. – Availability of inquiry sales quotations. – Availability of inquiry sales orders. – Availability of inquiry for movements related with customer. – Availability of inquiry for allocates payments and credit notes for customer. – Availability of recording work centers for manufacturing processing and capability to modify or delete data. – Availability of add list combination manufactured articles and capability to modify or delete data. – Availability of add commands to run for manufacturing processes and work control commands in arrears. – Availability of add dimensions to know the all private accounts and determine the period that the dimension be available. – Availability of show the finished dimensions and make modification to its data. – Availability of determine the key words of dimensions. – Availability of record banking accounts and determines the currency for each account and determines keywords to account and your bank account and determines type of account articles and capability to modify or delete data. – Availability of add types of currencies and capability to modify or delete data. – Availability of make the exchange rate of currencies added to the main currency used in the system. – Availability of add mainly classifications to accounts with determine the type of main category (assets, liabilities, owner’s equity, revenues, expenses, cost of goods sold) and capability to modify or delete data. – Availability of add sub accounts of main accounts. – Availability of recording currency revaluation. – Availability of recording daily journal entries. – Availability of recording the estimated budget for each month. – Availability of recording the settlement banking accounts if there is a deficit or surplus. – Availability of recording revenues and expenses. – Availability of recording banking payments. – Availability of recording banking deposits. – Availability of recording the transfer between banking accounts. – Availability of show data of daily journal entries. – Availability of show data of general ledger. – Availability of show data of trial balance statement. – Availability of show data of profit and loss statement. – Availability of show data of balance sheet. – Availability of show data of banking accounts. – Availability of inquiry about taxes during a certain period and show the paid amounts and amounts not paid yet. – Availability of set the company settings , determine the currency and fiscal year and data that will appear in reports. – Availability of set access setup and determine the level powers and capability to modify or delete data. – The ability to make users of the system and determine the level of access that falls beneath the user and the work on the edit and delete their data. – Availability of controlling on the form of date. – Availability of determine the language of the system. – Availability of determine page size inside the program. – Availability of determine decimal points. – Availability of change the form and color the system. – Availability of determine list indicator start up. – Availability of determine the shape of comma and appearance of this comma or not. – Availability of determine the appearance of help message. – Availability of making certain language system as default. – Availability of adding fiscal years and capability to modify or delete data. – Availability of close any fiscal year. – Availability of adding many groups to tax and capability to modify or delete data. – Availability of specify tax in general ledger accounts. – Availability of recording tax exemption for certain item. – Availability of adding system printers and capability to modify or delete data. – Availability of determine the type of printer for each report. – Availability of determine accounts inside the system. – Availability of enter the terms of payments and capability to modify or delete data. – Availability of adding shipping company and capability to modify or delete data. – Availability of adding sales points and capability to modify or delete data. – Availability of deleting any movement recorded. – Availability of show and print any movement. – Availability of attach documents and capability to modify or delete data and download any document. – Availability of make backup from database. – Availability of make restore the version from the database. – Availability of download any database you want. – Availability of delete any database you want. – Availability of know the numbers of existing users who are now on the system. – Availability of record companies inside the system and every company has its private accounts. – Existence of editor to search on this system. – Availability of determine destination of each report. – Availability of print the report with more than one issuance. – Report of customer balances and availability of determining the report period. – Report of total customers balances and availability of determining the report period. – Report of Aged Customer Analyses and availability of determining the report period. – Detailed report of customer movements. – Report of sales summary and availability of determining the report period. – Report of price listing. – Report of order status listing and availability of determining the report period. – Report of salesman listing and availability of determining the report period. – Report of printing sales invoices. – Report of returned sales invoices (credit notes). – Report of printing deliveries. – Report of sales orders. – Report of sales quotation. – Report of printing receipts. – Report of supplier balances and availability of determining the report period. – Report of aged suppliers analyses. – Report of payment of supplier. – Report of outstanding GRN. – Report of printing purchases orders. – Report of printing remittances. – Report of inventory valuation. – Report of inventory planning. – Report of stock sheet check. – Report of inventory sales and availability of determining the report period. – Report of GRN valuation. – Report of under the limit demand. – Report of stock items with purchases and sales prices. – Report of quantities in stores. – Report of suppliers according to items. – Report of bill of material listing. – Report of printing work orders. – Report of dimensions summary. – Report of banking statement and availability of determining the report period. – Report of charts of accounts. – Report of journal entries list. – Report of general ledger accounts transactions. – Report of annual expenses breakdown. – Report of balance sheet. – Report of profit and loss statement. – Report of trial balance. – Report of audit trail.